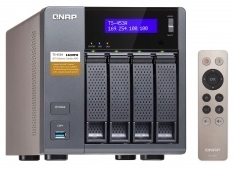 What I particularly like about the QNAP system is that it oozes functionality. Nothing elaborate in terms of style or base technology, but there are a raft of free apps to do just about anything you need to. This means that it makes good sense when you need to install for small, medium or large businesses as there is some scalability there. You can run Virtual Machines (VMs) on there so it becomes far more than just a dumb NAS box. It also integrates nicely with a Windows Server environment, taking identities from the Active Directory and bringing them over into its own environment. The box itself is quite well made and fairly compact. We went with a 4-bay unit that we popped some 4TB drives into and got our overall storage capacity up to 8TB (more on that later). The TS-453A 4G NAS server is said to be designed for small to medium sized businesses, allowing its users to use the NAS as a storage device and a multitasking and multifunctional light-weight server. It is powered by a decent Quad-core Intel® Celeron® N3150 CPU and there is dual-channel 4/8GB DDR3L-1600 RAM (upgradable to 8GB). There are 2 Gigabit LAN ports which allow connection to 2 separate networks and the hard drives are SATA 6Gb/s. The TS-453A can deliver up to 224 MB/s read speeds which is not too shabby. Unusually the TS-453A can automatically increase the processor’s clock rate from 1.6GHz to 2.08GHz when performing CPU-intensive tasks. There is AES 256-bit encryption for both full NAS volume and shared folders, which ensures the safety of sensitive business data that may be stored on the drives. A nice touch is that the TS-453A features an Intel® AES-NI hardware-accelerated encryption engine. This helps to drive transfer speeds theoretically up to 224 MB/s, which is a welcome boost to system performance & security. Home video streaming users will like the 4K (H.264) video playback and 1080P/4K video real-time transcoding right from the NAS to an HD or 4K display. It also has 1080p video transcoding to convert videos to universal formats that can be smoothly played on PCs, mobile devices and Smart TVs. There is real-time and offline 4K video transcoding which we didn’t have chance to test but sounds good. This QNAP box uses QTS, which gives a super-slick NAS experience. The interface is a no-frills, classic Linux look – functional and fast. We found that the intelligent desktop allows you to search for functions extremely quickly (there are lots of them!) and running multiple application windows was not a problem, even when we loaded multiple apps and tasks at the same time. The TS-453A runs something called Real-Time Remote Replication (RTRR). In short, this supports real time and scheduled data backups to either an FTP server or another QNAP NAS. It also synchronizes files to a remote folder from a local folder. What we liked was the rsync support which pushed our data to our remote server at our pre-programmed schedule. If you are interested in this, the push/pull supports Amazon S3, Amazon Glacier, Microsoft Azure, ElephantDrive, Dropbox, Google Drive, Google Cloud Storage and a few more. set up the system to automatically take a snapshot of the volume before backup via ssync/RTRR (even when the file is opened). You can host virtual machines on your TS-453A via QNAP’s VM hypervisor called ‘Virtualization Station’. Access to these is provided by VNC or a web browser interface. The TS-453 and the VMs can share the same LAN port as it uses high-speed virtual switches and Software-defined networks (SDNs). We noticed little or no lag in our testing which was impressive. QNAP’s ‘Container Station’ integrates LXC and Docker virtualization technologies, allowing you to operate multiple isolated Linux systems. For the Docker fans out there, you can also download apps from the built-in Docker Hub Registry. 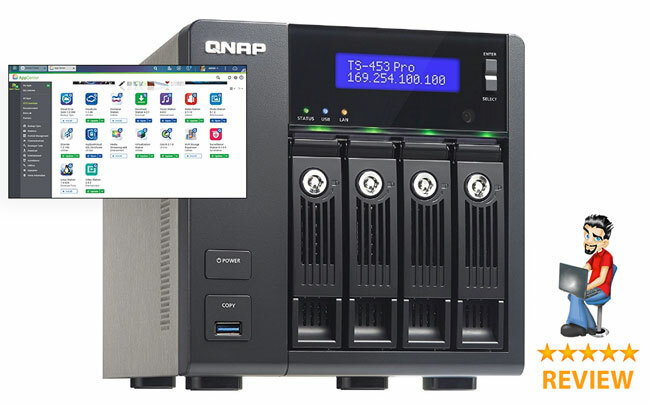 QNAP’s file searching is impressive and when we loaded up a Gmail backup with over 15,000 emails it searched very quickly to locate our email, offering a preview of it. There’s also an online document app which adds edit and preview functionality to files. The TS-453 supports SMB/CIFS, NFS, and AFP protocols which means that you can file share across Windows, Mac and Linux/UNIX networks. Data, logs and ISO images of CDs and DVDs can be centrally stored on the TS-453A and protected by an integrated antivirus solution. The Windows Active Directory and LDAP services enable system administrators to configure user permissions by using an existing Windows AD server, LDAP server or built-in LDAP service. The TS-453A supports SAMBA v4 and can act as a Windows domain controller to manage privilege settings. We went with the 4TB Western Digital ‘Red’ drives that are specifically designed for continuous use and general NAS usage. They are pretty much silent when spinning and come with the WD 3 year guarantee (register for this when you get the drives). We setup a raid array that gave us some redundancy but you could go all-out and combine all the drives into one big fat storage pool. Your call, but make sure that you have backup whichever way you go. Pushing to Amazon S3 is a good call. All in all, this unit excels at being a NAS drive and adds superb additional functionality into the mix. It’s versatile and cross platform and doesn’t require additional software or licences to perform. The simple, clear interface makes some normally heavy technical tasks quite painless. It gives the current offerings from NAS mainstays such as Synology a real wake-up call to add some useful features to their operating systems because many SMBs need these additional tools now. We’d suggest that you give it a try and we’re pretty confident that you’ll be a convert. Most read, Product reviews. permalink.